Oslo Black Metal exponents founded in 1993. DIMMU BORGIR, taking its title from the Mývatn volcanic formations in Iceland dubbed 'The Dimmuborgir', or "Dark fortress", deliver bombastic Gothic driven Metal laden with choirs and effects. Unlike the majority of their contemporaries, Dimmu Borgir never demoed. 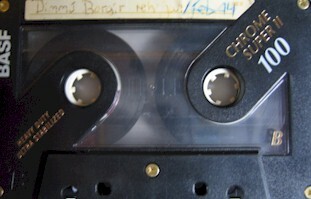 The only tracks committed to tape were rehearsal recordings for the band's own use. First product would be the three track 7" EP 'Inn I Evighetens Mørke' ("Into The Eternity Of Darkness") published in October 1994 on Necromantic Gallery Production. Only 1000 copies were pressed, in a colour sleeve, but a stream of monochrome jacketed bootlegs followed. Their debut full length album, 'For All Tid' ("For All Time") engineered by Bård Norheim at Stovner Rockefabrikk, emerged on the notorious German No Colours label that December. The cover was a regular Xeroxed cover and the tape was an ordinary tape. Very limited, maybe 10 or less!